Should I Groom Puff Or Groomer? I don't know that one is better than the other. It depends on your grooming skills and what you are looking for. I have 4 dogs and groom them myself. A pair of clippers and accessories is far cheaper than having a professional groom every 6 weeks over the years. That being said, my dogs are not show dogs. If I had a show dog, I would probably have it professionally groomed as I haven't had training. My gang is also very tolerant of what I do to them, as I start when they are puppies (or when I first get them). Thank you for your reply! I would prefer grooming him, but am afraid I will mess up his pony cut lol. Is it pretty self explanatory to do? Eeek nervous. My feeling is, their hair grows back quickly (I'm talking about non-show dogs). If you screw it up, try again next month until you get the look you want. There are some very good posts on this forum as to how to groom your dog. I think the biggest thing is to get the dog used to being handled and groomed. Comb your pup on a regular basis, get them used to the sound of the clippers, touching their feet regularly for nail trims and provide food reinforcements for good behavior (Cresteds love food!) -- I use dehydrated Lima beans. Thanks! One more question- do you have a clipper/razor you recommend? I currently use an Andis corded clipper. I had an Oster before and found it heavy and awkward to use. I am not an expert. My goal is to to find something that is light weight and quiet. If you search the forum, there are great recommendations. Sadly, as technology constantly changes, the perfect clipper requires a lot of research. Sorry! I had a groomer recommend the Wahl grooming combs which I love (they attach to the clippers). Search Amazon and confirm that the combs are compatible with your clipper of choice. 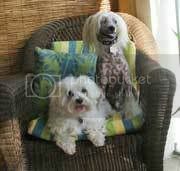 I have 5 dogs at the house, DD's Maltese, a 15-year old Maltese/Poodle mix, a Puff and 2 hairless CCs. They all have different grooming needs for their coats. I recently bought a BaBylissPRO (cordless & rechargeable) which I use on the faces and the 2 hairless CC's bodies. Sorry for the rambling, but it wasn't an easy question. LOL! I have a small WAHL beard trimmer that is just perfect in my opinion for doing ears and faces... I have a standard sized set of WAHL shears that I use for their bodies. It isn't hard to do, and as long as you aren't going to show, its mostly just a matter of trimming them in the way that looks good to you! Their skin is very thin, so just take your time, and like I said in the other post, lots and lots of practice "grooming" getting them used to being handled and the sounds of the clippers and so on... It can be a very rewarding experience for the both of you if you use it as a time to bond! Just make sure to keep it fun for both of you... if it starts to feel like work, neither of you are enjoying the experience and it can make you both jaded! Have fun with your new little one! I am excited for you! I think it depends on how comfortable you are with a shaver. I can not do the faces, I've tried many times. Even bought a peanut and got nowhere. That said, I shave my very hairy hairless and even though she is coming out looking good enough, I have an appointment with my groomer so I can see what she should look like. Give me a true hairless anyday!!! I do my powderpuff in a lion/puppy cut and he comes out well enough. Certainly not a show dog but better than mats.